Yes, North Korea fired artillery shells at South Korea. 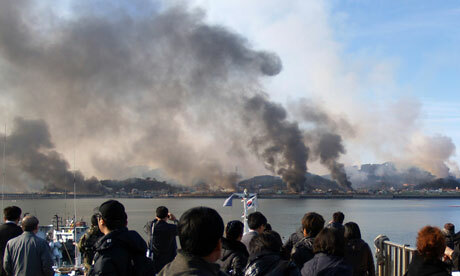 And no, that isn’t a photo of Seoul burning to the ground; it’s Yeonpyeong, the little island they attacked. And I’m saying “big deal” about the small scale of the attack, not the fact that three people died which definitely is a big deal to the people who knew them. As for what the locals think of all this, I can’t really say! I only watch the news when I wanna see if they have any hot anchors on air since I can’t understand what they’re yammering on about, and people on the streets aren’t exactly running for cover. Some people are probably worried but it’s not like I’m out there conducting man-on-the-street interviews. I’ll worry when “getting bombed in Kangnam” actually means getting bombed in Kangnam. That would be tragic.